I very much wish to give something away by way of thanks for the many kind words and support that followers have given to me - you have seen me through CLgate (I wonder who the winner was there - I cannot bring myself to look!!!) and the other 'gate of which we no longer speak..... I am a queer fish and find the machinations of the internet strange and wonderful in equal measure. Anyway I wanted to give some things away by way of thanks. Three different things for three different followers - easy. Lined with vintage Irish double damask. 9/11 per yard! Anyway after much sifting I did indeed decide upon this David Whitehead fabric - nice rich colours I think. I have made this as a large cosmetic/wash bag so lined with some wipeable fabricos - fine and dandy for weekends away. I like the mix of graphics with this design and the colour just so happens to match this 50s wallpaper. I know, I know I said that I would use this but could not bring myself to paste it to the wall. Daft as now this is being reproduced (but not in this colour!) I could just buy some more but it is not the same is it. I then spent an age looking for some old red ric rac for the zip - searched all my ruddy tins (why or why do I have so many...) and I know it is here somewhere. A bit of ribbon had to suffice for the photo but I will endeavour to find it. Moving on a few years to the 1960s/70s - I was looking for some Frieda Clowes curtains that I know are in this house somewhere - could I find them...could I? 'No' - was the answer - by this time I was getting a bit hot and bothered. Found some nice Noddy fabric that I had forgotten about so that was good. Finally decided upon this Scandinavian fabric that I think dates from the 70s - good strong colours and strong design again. I have lined this with some vintage bright orange fabric as you can see below. PS Worried already as I have just read that giveaways come under some sort of lottery regulations!! Is that for real!! Crikey! Also a reminder that contrary to what a friend said I am not doing this in order to exercise control over you! It is just because and 'just because' things are nice to have now and again. Fabulous - all of them. Your choice of fabrics are brilliant! How to choose just one? Blimey. Hmmmmmm...I think No. 2 - that fabric is gorgeous. Very generous Jenny. And lovely. Rhooooo, I like to play!!! I never win anything, but it doesn't matter at all! Did I write number one? Yes, numéro 1! If I'm allowed to choose then no2...as I'd love to see your zip insertion close up ha ha ha actually I love the fabric too.... they are all beautiful. You are very generous in such a big giveaway. No 2 is very cheery, and I would love to enter the giveaway. I am quite reassured to hear that your projects sometimes go a bit awry (because mine almost always do!). I think number three is my favourite, but they are all lovely! Oh my! Such fantastic wonders! I used to be so good at decision making, I could way up all the options in seconds and make the right choices! I tend to deliberate and then hange my mind half a dozen times now! I love them all soooo much, if I was to choose, well I have to don't I? !, it would be number one, just delicious, sorry two and three, I love you too! Is losing everything/forgetting where stuff is a consequence of age or the we just have too much stuff?! I like to think the latter! What a fabulous giveaway. I'd love to be considered. Lordy, which one to choose. Numbers 2 or 3 (or 1). Oh God. Don't mind. Number 2. I LOVE THE EMBROIDERD PURSE. JUST BEAUTIFUL. SO NICE YOU CAN SHARE THEM WITH US. Oh Crikey what a lovely choice!! My absolute fave is #3 but would be delighted with anyone of them! Ooh Ms C these are truly loverley. How very kind of you to offer a giveaway to us lot. I would love to nosey through your stash of 50s fabrics I've spotted some absolute gems in your photos before but I dont know how you can bear to cut into them let alone share them! therefor I'd like to be entered into the pot for number 2 please. Thankyou! Surely no regulations! I'm about to do my umpteenth giveaway and have never had any trouble (do pop over at the end of the week if you'd like to enter). I would love the chance to win number 1, please - you really do make such super things! Its so bright and cheery and would bring a big smile to my face every time I used it.I have big tin love too and never can resist any,that one in the same piccie looks delicious! Chalkie white would choose the number one purse I think......beautiful.all three items are brilliant.you are so good at choosing just the right lining from the HUGE stash you seem too have! Fingers crossed it is me.....item one preference, but would gladly have any of the lovely items. Oh Jenny you clever thing....all three are absolutely gorgeous but number 1 is my favourite. Jenny love your sweet creations!! I do love the cute snap closure and the embroidery of the 1st choice though any of the three would be a happy welcome! All such lovely makes, I would be happy with all but number one is my favourite. Fingers crossed. Hi Jenny,it would be number one for me (as you're my number one blog!! )Kind Regards Pam. Hello, how do you find so many beautifuly things, there isn't any lovelies in my area, sob. No 1 is the most popular and mine too, because it is so pretty. My late mum used to do these embroideries in the thirties and I think I have a few but am not good at sewing and too scared to take the plunge. Although I would love to win, maybe I would be inspired instead. I love all of them but number 2 has great fabric. I found your blog the other week, I love the things you make and create, may I join in...........? I love purse number one! Groan...must I choose? well, then number 1 is my choice, but it was so hard!! They are all just lovely. What a lovely giveaway. I love them all, but if I have to choose I think I will go for number two. Too hard to choose. I love all three! Such treasures, Jenny - the David Whitehead red one is my fav - the graphics are so fine!! 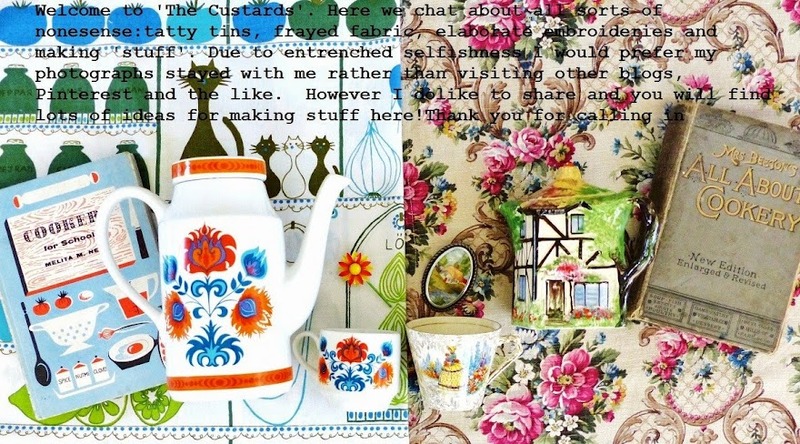 Your blog continues to a treasure chest of surprises and lovely stitching - thank you! Hi jenny thanks for the chance to win one of your fab items! I have been follwing you for months now and you make me smile some. I would choose number 3 as it reminds me of a train my mother embroidered for my room as a child all the bright colours made it so wonderfull. I would use the purse for my handbag crochet projects, it would look great! What joy your blog has given me. I found you just three days ago and have since read all your posts and lingered long over your truly exquisite pictures, you’ve made me smile too! I am in awe of your many talents and you have inspired me to try my hand at making a bag. I love embroidered cloths and have a number that my Mother created, whether I can take the scissors to just one of them is rather doubtful though, but I’m heading off to our charity shops this morning in the hope I can find something suitable. Like you I am a collector, a hoarder, can’t throw things away type of person... my theory is that one day I will find a use for them and I usually do. I love my utter clutter of fabrics, trunks, suitcases and boxes full of the stuff, yes ‘stuff’... that word so fittingly describes it all. I love your collection of vintage tins displayed in your beautiful blog header, but I do wish it didn’t disappear so quickly, I’d like to have time to enjoy each one. Your clasp purses are a dream. If I dare to choose, the embroidered number one is my favourite... but the joy of sharing your pictures has been a gift in itself and I thank you for that. I feel inspired. So inspired by your blog. Downloaded some old mollie makes mags and saw your 'my space' piece. So lovely! Loved number 3 the best. I can see my daughters little treasures being kept safe in such a pretty purse. Thank you for calling in Lynne - sadly the giveaway finished a year ago but I am planning another one soon. Kindness is my middle name....I am joking!!! do you have a blog Lynne? ps i don't have a blog - at the mo - i am trying to build up to it but haven't the foggiest who would want to read it even if they could find it!!!!! also the reason i found this again is that it "popped" up again as i read your latest entry!!!!!!!! !